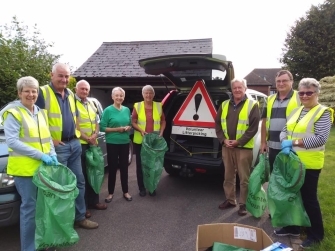 Brian Cushing and Tel Baines help organise the monthly West Farleigh Litter Picking group. 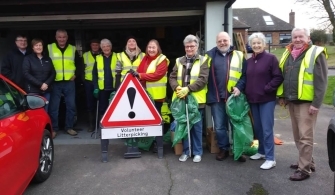 Occuring the first Sunday of each month, volunteers assemble at 9:00 a.m. on The Green outside the Good Intent and put in an hour's cleanup before assembling at one or others' houses where a reviving hot drink and bacon butty is provided. Please come along and help our group try to keep our village roads and public spaces as tidy as possible. Every little helps and it is only for an hour (plus however long you wish to make the bacon butty and drink last). Why do people drop litter? Why don’t they realise it makes our surroundings, town or country, look uncared for and squalid? It rubs off on the inhabitants because they seem indifferent, when the volume and frequency of littering get beyond us to clean up. Is there a demographic that defines litterers? I think we would be hard put to find one. Is it a modern generation that doesn’t care about the society in which it lives – maybe an unfair assessment. My generation was raised in a 1940’s and 50’s society which in many respects paid little heed to the environmental cost of rubbish disposal as practiced then. For the most part it finished up in tips where it was eventually buried.There was little attempt to separate and recycle stuff, albeit that municipal incineration of waste material had made some progress in the late Victorian period; a natural extension, and eventual replacement, of the disposal by burning of individual houses’ waste by the occupants. Everything went into a metal dustbin which was collected by the local council’s dustmen and chucked into a dustcart which, when it disappeared down the road, was out of sight and out of mind. Of course, the volume of rubbish in the 50’s was far less than we are faced with nowadays. We inhabit a disposable environment in which most wrapping and packaging is of metal or plastic derivation and hence not readily bio-degradable, unlike, to some degree, the paper and card which was prevalent in the fifties and before. Confectionery packs, non-alcoholic drinks material, fast food-related litter, snack packs and discarded food and drink are all litter types associated with the consumption of food-on-the-go... 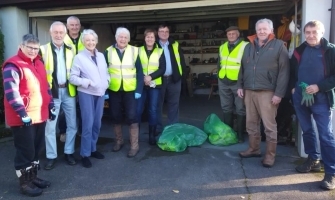 It is unlikely that local authority budgets for street cleansing will be increased in the foreseeable future, so it is important that all of those groups involved in reducing litter continue to work together in partnership so that people can enjoy a litter-free environment throughout the country. The 2014/15 LEQSE shows a continuing picture of improvement since the survey started in 2001. Most sites surveyed continue to have an acceptable standard of local environmental quality [my emphasis] and this is a testimony to all those involved in keeping the country clean - local authorities, contractors, businesses, volunteer groups and individuals who work within their local communities. I think we would argue, as a matter of personal experience, that having cleaned any section of our village roads and lanes, it’s only a matter of days before thrown litter fouls it again. I was a cadet at a navy training college in the sixties, a ship on the Thames. The chief officer, in retrospect a rather stupid man, but one who as kids of 13 to 15 we held in some awe, used to exhort us that there was no reason for the ship to get untidy as just overboard was the biggest dustbin in the world. By which of course he meant the Thames and ultimately the sea beyond. So over the wall regularly went the contents of all our dustbins, trash cans, sweepings and all types of garbage both organic and inorganic. You might think that thereby I and my generation grew up careless of the state of our surroundings. Yet in fact we became rather aware of pollution, and in the succeeding decades ever expanding legislation ensured that garbage could not simply be dumped overboard from ships. As opposed to shore population centres, ships are of course controlled environments and it is relatively easy to police the correct methods of rubbish disposal, by way of port state inspections and so on. But the problem endures on land, the most common garbage type being of course plastic in its thousands of formats. The problem we have now with plastics in the sea is not so much ships dumping the stuff but litterers on land whose castoffs blow around and fetch up in rivers and the oceans; that and plastic microbeads leaching into waste and sewage systems from face scrubs, shower gels, toothpastes and cosmetics which fetch up in the stomachs of marine life. Some years after college training I was sailing in the South Pacific islands. This was in the seventies and I was struck time and again by the beauty of the environment....but it was frequently ruined by the litter, mainly non-biodegradable plastic bags, dumped on the beaches, paths and roads by the inhabitants. This was not stuff which had floated in from the ocean, and it wasn’t thrown by people passing through, because at that time there were hardly any visitors to many of the islands. So here we had a situation in microcosm where it was the locals doing the damage, and I have seen it repeated in countries across Africa, the Middle East and elsewhere. In our village, it appears to be everyone’s view (if the number of people that I have spoken to are taken as representative) that littering is repugnant to them. Which leads naturally to the conclusion that as far as our village is concerned it’s people in transit that are doing the damage. 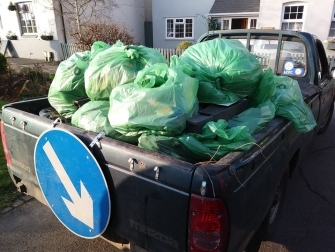 The fact that, as the litter-pickers have found, pretty well all of the rubbish is found on the verges of our lanes and roads leads to the inescapable conclusion that it is vehicle drivers and their passengers who are the guilty ones. So if the stuff that gets discarded nowadays is so indestructible, surely that should make us all rather more careful about its disposal, shouldn’t it? Surely sensible people would realise that it’s one thing to chuck a paper bag that would rot down in a matter of months, but another to dump a Coke tin composed of aluminium alloy with a plastic lining which will still be around in its extant form in ten or more years’ time. However, I’m no closer as to who these people are or why they take this irresponsible attitude. The litter is found not just on the main road, but on minor roads and lanes used as local short-cuts and bypasses, perhaps the litterers are fairly local – maybe from Maidstone en route to Paddock Wood, or any other of hundreds of journeys made within a radius of a few miles. What age group are they? It’s tempting to suppose that older people are generally more responsible in their attitudes, and hence it’s a younger generation doing the damage, but that’s not incontrovertible. Arguably, the young are now more aware of the fragility of the planet than the old, who supposed it would just roll on forever. Perhaps the miscreants are all ages. Do males litter more than females? Subjectively, I think that may be the case – because social science research that you can google shows that women are ‘greener’ and are supposed to notice and to care more for their environment. What does the law have to say? Anyone who drops litter in a public place or on an adopted highway, including throwing litter from a vehicle, is committing a crime under the Environmental Protection Act 1990. Litterers can be prosecuted in the courts and fined up to £2500. But do the litterers care about this or are they even aware? It seems not, any more than speed restrictions are never adhered to by some. Is there a connection between speeders and litterers then? That should surely be the case, if only because both evidently are irresponsible and have little concern for the environment – but again that’s a subjective conclusion on my part. Recently I happened to follow a car out of Paddock Wood, a late model BMW with visibly a young couple in it, not speeding but sticking reasonably to the limit. Suddenly the female passenger stuck her arm out of the window and threw a whole 5 bunch of litter – wrapping, boxes – onto the grass verge. Immediately afterward, they turned off into a garden centre. This rather threw my perception of the possible demographic, on several grounds. On the one hand the dumper was young, but then she was female. The car wasn’t being driven much over the speed limit and was an expensive model, so maybe you could assume that the couple were responsible professionals of some sort. Having committed what was in actual fact a crime, these folk turned off into a garden centre, presumably to look at some garden stuff. Not the type of activity you might associate with irresponsible yobboes. In this article, I had set out to try and define the type of person who knowingly throws litter which in its modern form will hang around for decades unless someone clears it up. I said at the beginning that it could be hard to find such a definition. I seem to have illustrated in this discussion that it’s not just passers-through that are guilty, but sometimes, in some parts of the world, the inhabitants. So my real conclusion is that other than having a few subjective views, I’m really no closer to answering the questions I posed at the beginning of this article. Why do people litter? I don’t know. Can we define a littering demographic? I can’t say. Is it a problem of our time? I hope so – because that way maybe there is hope for the future environment.